What's the best color for you? If you're thinking of coloring your hair, a hair color consultation will come in extremely helpful. Whether you're a newbie to the world of color or have done it for years but just want to try something completely different, you'll benefit from this service. We've all heard those horror stories about hair dye jobs gone bad. There was the brunette whose highlights turned out far too light. Then there was the blonde whose anticipated golden locks turned yellow. It's enough to make anyone cringe in embarrassment and, even worse, stay indoors for days. Fortunately, even the worst hair disasters can be fixed with the help of an experienced colorist. Finding the right person is only a matter of calling around and selecting someone who's willing and able to do the job. Of course, you can avoid this situation altogether by undergoing a hair color consultation. Not only is this service an absolute must for anyone who has never had his or her hair colored before, it also helps prevent disasters, gives people an idea of what hair colors might look best on them, and makes future appointments much easier. Though color consultations have been around for years, time has also given way to a slew of differing methods that allow individuals to receive reliable advice in the comfort of their homes. Others, however, may opt for the tried-and-true method of visiting a hair salon. These days, there are several types of consultations to choose from. Technology has afforded the beauty industry some pretty staggering benefits. Computerized consultations make it possible to see what a person will look like after undergoing plastic surgery or styling hair in a completely different manner. It should come as no surprise, then, that computers also aid individuals who are looking to try out a new hair color. Hair color simulations, also called virtual hair coloring, allow people to test different colors and determine which shade suits them best. This service is especially beneficial to those who have never colored their hair or are planning on a drastic change. Usually the simulation offers a wide selection of colors and hairstyles to provide the best estimation of the end result. Select salons offer simulation services, but it's also possible to do the work on your own with the help of hair simulation software. Once you've installed the software, you can use your own photos to test styles and colors with. Print out the images you like to take to the salon, or show them to friends and family to gauge opinions. When in doubt, turn to the experts. If you're a busy bee who just can't find the time to head to a salon, consider an online consultation. It's quick, simple and effortless - all you really need is internet access! Select websites offer these consultations in chat formats. Anyone with a question or concern about color can chat with an expert consultant who is trained to guide users through the often tricky process of coloring hair. First-timers will especially appreciate this service, but it's appropriate for anyone who is about to color their hair. Of course, nothing compares to an actual in-salon consultation. Sitting in a comfortable chair and allowing an experienced colorist to examine your hair and determine which color or colors would best suit your features is the ideal choice if you're a first-timer. It's also recommended for anyone who's suffered through a hair color disaster and lived to tell the tale. When it comes to the colorist-client relationship, nothing is more important than communication. Walking into an appointment without at least some idea of what you want can be detrimental to both of you, and it's always more helpful if the colorist and client are on the same page. This is why a consultation is so important: It's the first step toward building a strong, open relationship that allows the client to feel comfortable. 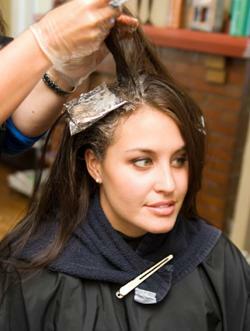 The colorist will ask the client a few simple questions to get things started on the right foot. What type of color is the client looking for? Does he or she want a subtle or more dramatic change? Does the client want highlights or lowlights? Skin tone, facial features and eye color are evaluated. An expert colorist takes these into consideration to choose the client's ideal shade. The hair's texture is also evaluated. Depending on whether it is fine, medium, or coarse, the texture indicates how quickly the hair will lighten or how resistant it will be (thus taking longer to color). If there is any gray hair, the colorist will take note of this in determining the right product for covering lighter strands. The colorist will also recommend several hair products for the client to use at home in order to best maintain the color and style, if applicable. Don't be afraid to bring photographs of colors you like. This automatically gives the colorist an idea of what you're interested in and communicates your preferences much more easily. Also, be realistic about your budget: How much you are willing to spend will also go a long way in determining the services you will undergo. A hair color consultation is a good step toward ensuring a great new hair color. From detailed evaluations to online chats and simulations, there are many ways you can try to determine which shades will let your hair shine.